Click to listen to episode (4:08). Unless otherwise noted, all Web addresses mentioned were functional as of 4-5-19. From the Cumberland Gap to the Atlantic Ocean, this is Virginia Water Radio for the week of April 8, 2019. This week, we feature a water-bird mystery sound. Have a listen for about 10 seconds, and see if you can guess this long-necked, diving, fish-eating creature. And here’s a hint: a double-feature on its crest forms a core part of this bird’s name. 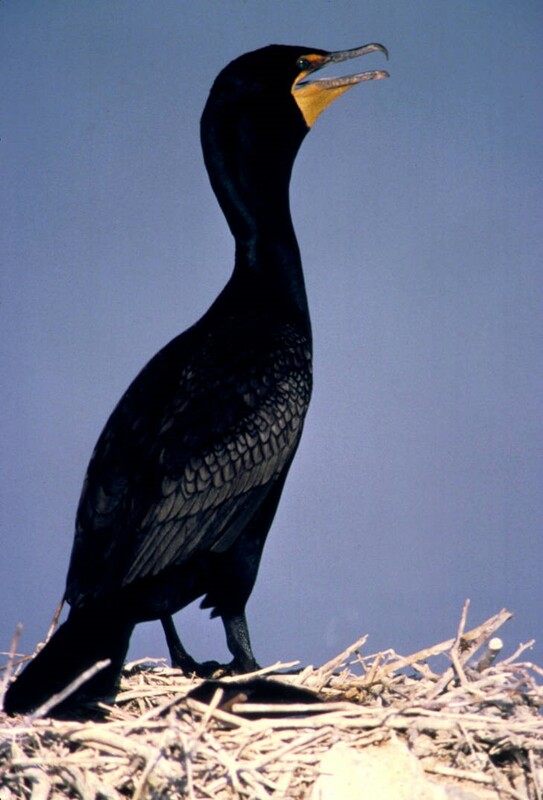 If you guessed a Double-crested Cormorant, you’re right! The Double-crested Cormorant is the most common of six species of cormorants in North America and two species in Virginia. Virginia’s other cormorant, the Great Cormorant, is the world’s most widespread cormorant but is a relatively infrequent visitor to the Commonwealth. The Double-crested is typically found along Virginia’s Atlantic coastline and around the Chesapeake Bay, and it’s also seen on inland ponds, lakes, and rivers, often resting on rocks, trees, or human structures. The two head crests that give this species part of its name are not regularly visible; much more noticeable are its long dark neck, its orange throat, its large nesting colonies, and its habit of holding out its wings to dry out feathers following a diving and feeding foray. Like other cormorants and the related Anhinga, the Double-crested Cormorant uses diving and powerful swimming ability to get its preferred food of fish along with many species of bottom-dwelling invertebrates. Cormorant feathers have less water-resistant oils, though, compared to other diving species like various diving ducks; this may make cormorants faster underwater, even as it leads to their on-land wing-spreading behavior. Big, behaving distinctively, and bound up in policy decisions: cormorants may make you do a double-take, even if you don’t see a double crest. Thanks to Lang Elliott for permission to use the Double-crested Cormorant sounds, from the Stokes Field Guide to Bird Songs. We close with about 15 more seconds of cormorant sounds, mixed in with some other bird species, from a series of recordings made by David Moroz within a colony reportedly of over 1000 cormorant nests. The first Double-crested Cormorant sounds were taken from the Stokes Field Guide to Bird Songs-Eastern Region CD set, by Lang Elliott with Donald and Lillian Stokes (Time Warner Audio Books, copyright 1997), used with permission of Lang Elliott, whose work is available online at the “Music of Nature” Web site, http://www.musicofnature.org/. The ending cormorant sounds were taken from David Moroz, “Soundholder - Cormorants,” online at http://soundholder.com/product/sound-library-cormorants/,” sample provided for public use by Freesound.org, online at https://freesound.org/people/Soundholder/sounds/425375/, under Creative Commons Attribution 3.0 License. Double-crested Cormorant painting originally published between 1827 and 1838 by John James Audubon in Birds of America (plate 257), as reprinted in 1985 by Abbeville Press, New York. Photo taken April 8, 2019, from the reprint copy (no. 6 of 350 copies printed in 1985) owned by Special Collections of Virginia Tech Libraries. Virginia Water Radio thanks Special Collections for permission to photograph their copy and for their assistance. Information about Birds of America is available from the National Audubon Society, online at http://www.audubon.org/birds-of-america. Two Double-crested Cormorants at the Virginia Tech Duck Pond in Blacksburg on April 3, 2019. Double-crested Cormorant, location and date unidentified. Photo by Rodney Krey, made available for public use by the U.S. Fish and Wildlife Service's National Digital Library, online at http://digitalmedia.fws.gov (specific URL for the photo is https://digitalmedia.fws.gov/digital/collection/natdiglib/id/4280/rec/3), accessed 4-8-19. Cormorants are a family of birds within the bird order Suliformes, which also includes frigatebirds, boobies, gannets, anhingas, and shags, according to the Cornell Laboratory of Ornithology’s “All About Birds” Web site (https://www.allaboutbirds.org/guide/browse/taxonomy/Phalacrocoracidae). Great Cormorant – Phalocrocorax carbo. John James Aububon, Birds of North America, “Double-crested Cormorant,” plate 257, online at https://www.audubon.org/birds-of-america/double-crested-cormorant. Chesapeake Bay Program, “Field Guide/Birds/Double-crested Cormorant,” online at https://www.chesapeakebay.net/discover/field-guide/entry/double_crested_cormorant. Cornell Laboratory of Ornithology, “All About Birds, online at https://www.allaboutbirds.org/. The Double-crested Cormorant entry in online at https://www.allaboutbirds.org/guide/Double-crested_Cormorant/; the Great Cormorant entry is online at https://www.allaboutbirds.org/guide/Great_Cormorant/. Kevin J. McGowan/Cornell Laboratory of Ornithology, “Frequently Asked Questions About Crows,” online at http://www.birds.cornell.edu/crows/crowfaq.htm. Cornell University Lab of Ornithology and American Ornithologists’ Union, “Birds of North America Online/ online at http://bna.birds.cornell.edu/bna (subscription required). The Double-crested Cormorant entry (Introduction) is online at https://birdsna.org/Species-Account/bna/species/doccor/introduction. Richard King, “When Dams and Dredging Alter an Ecosystem, Blame It on Cormorants,” Living Bird, August 2014, republished by the Cornell Laboratory of Ornithology, “All About Birds” Web site, online at https://www.allaboutbirds.org/when-dams-and-dredging-alter-an-ecosystem-blame-it-on-cormorants/. Alice Jane Lippson and Robert L. Lippson, Life in the Chesapeake Bay, Johns Hopkins University Press, Baltimore, Md., 2006. Oxford Dictionary and Thesaurus-American Edition, Oxford University Press, New York, N.Y., and Oxford, England, 1996. Chandler S. Robbins et al., A Guide to Field Identification of Birds of North America, St. Martin’s Press, New York, N.Y., 2001. Stan Tekiela, Birds of Virginia Field Guide, Adventure Publications, Inc., Cambridge, Minn., 2002. Virginia Department of Game and Inland Fisheries, “Fish and Wildlife Information Service/Double-crested Cormorant,” online at https://vafwis.dgif.virginia.gov/fwis/booklet.html?&bova=040024&Menu=_.Taxonomy&version=17991; “Great Cormorant,” online at https://vafwis.dgif.virginia.gov/fwis/booklet.html?&bova=040023&Menu=_.Taxonomy&version=17994; and “Anhinga,” (online at https://vafwis.dgif.virginia.gov/fwis/booklet.html?Menu=_.Taxonomy&bova=040025&version=17991). BirdNote®, a daily broadcast/podcast on birds, online at http://birdnote.org/. Cornell University Lab of Ornithology, “E-bird,” online at https://ebird.org/home. This program was featured in Virginia Water Radio Episode 440, 10-1-18. Cornell University Lab of Ornithology, “Merlin Photo ID,” online at http://merlin.allaboutbirds.org/. The application for mobile devices allows users to submit a bird photograph to get identification of the bird. Virginia Society of Ornithology, online at http://www.virginiabirds.org/. The Society is non-profit organization dedicated to the study, conservation, and enjoyment of birds in the Commonwealth. Xeno-canto Foundation Web site, online at http://www.xeno-canto.org/. The site provides bird songs from around the world. All Water Radio episodes are listed by category at the Index link above (http://www.virginiawaterradio.org/p/index.html). See particularly the “Birds” subject category. 6.4 and 7.4 – meanings of unfamiliar words - a. word origins and derivations. 3.10 – impacts on survival of species, including effects of fire, flood, disease, and erosion on organisms. 3.4 – behavioral and physiological adaptations. 2.5 – living things as part of a system, including habitats. 3.6 – ecosystems, communities, populations, shared resources. LS.8 – community and population interactions, including food webs, niches, symbiotic relationships. LS.9 – adaptations for particular ecosystems’ biotic and abiotic factors, including characteristics of land, marine, and freshwater environments.